C/Col Steven R. Gullberg II, center, receives Spaatz Award #1465 from Maj Gen Loran Schnaidt. C/Col Gullberg’s father, Lt Col Steve Gullberg, at right, received Spaatz Award #439 25 years previously. Well over 100 people attended a reception honoring Cadet Colonel Steven R. Gullberg II and witnessed him receiving Spaatz Award #1465. This already special occasion takes on even greater significance as Steven is believed to be the first second-generation recipient in the award’s history. 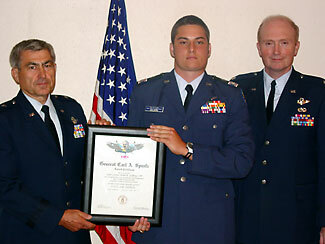 C/Col Gullberg’s father, Lt Col Steven R. Gullberg, USAFR, earned the Spaatz Award in 1977. Maj Gen Loran Schnaidt, retired commander of the Missouri Air National Guard, was the keynote speaker and presented the award. General Schnaidt had previously presented Steven with both the Mitchell and Earhart Awards and reflected fondly on watching him grow. C/Col Gullberg joined CAP in 1996 and is currently a high school senior. He is the Cadet Commander of his squadron, plays varsity football, and has soloed in both gliders and powered aircraft. He intends to enter college as an aviation major and pursue a career as an airline pilot. He plans also to join the Air National Guard. Lt Col Gullberg was presented Spaatz Award #439 in Jamestown, NY in 1977. He presently serves as the Reserve Forces Director for CAP-USAF’s North Central Liaison Region and flies as a pilot for American Airlines. His younger son, C/2d Lt Greg Gullberg, intends to be the family’s next Spaatz recipient. 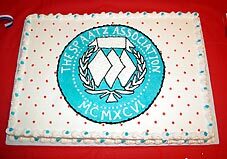 C/Col Gullberg’s award reception featured this cake & frosting rendition of the soon-to-be-introduced TSA coin. Other Spaatz awardees in attendance were Air Force Reserve 2Lt David Casler, #883, Maj Mike Toedebusch, #1168, and Capt Erica Williams, #1410. All three were speakers at the ceremony, as well as were Missouri Wing Commander Col Joe Casler, Vice Commander Lt Col Mike Bush, Chief of Staff Lt Col Sharyn Rugh, and Steven’s former Squadron Commander, Lt Col Dave Glass. His current commander, Capt Barry Johnson, served as the master of ceremonies.